You’ve spent so much time watching the livestreams & webinars, reading all the blogs & how to posts, wondering about packaging & pricing, websites, funnels, & the marketing madness … trying to crack the code on making your first $10k - how to actually develop your signature offers & get the leads, clients, & money rolling in! You can feel the epic impact, transformation, & results you KNOW you could make in people's lives & <insert your expertise> (for my clients it’s business, marketing, PR, health, finances, relationships, personal style & beauty consulting, career, mindset, product or brick & mortar businesses, etc.). But sometimes putting THAT into words in person, on paper, or on camera, let alone create an actual program you need to be able to sell feels impossible. So you continue giving it away for pennies, or free. Or, you avoid the dream all together, questioning whether you can make real money outside of your career yourself, if you have marketable skills people would actually want to pay for besides simply helping friends, giving yourself all the reasons you don't deserve it or why you're incapable of having it all, afraid you’ll fail. When the reality is, anything you put YOUR mind to, you achieve, no matter what! How much longer are you going to continue settling for mediocre, waking up to this robot lifestyle, limiting your shine & gifts to fit someone else’s agenda instead of what you know you were really meant to be doing in this world!? I went from being a first generation college student raised by a single mother living check to check to the "perfect career" working for a Fortune 500 company traveling & managing 5-7 figure clients, personally responsible for $5 million dollars of business. To my family, I had “made it”, but inside I felt undervalued, unappreciated, overlooked, overworked, & LOST! Work long nights, early mornings, weekends try to prove yourself for a mere 2-3% annual raise the same people who come in late, take time off every other weekend, & talk crap about the management team at lunch gets too! Until I realized I’d be sucking it up for decades to come! It felt like a 400 lb woman with 5 inch stilettos was stomping on my soul! I didn't have all the answers, resources, or support, but I knew that something huge within me was ready to burst & make a difference in this world & I was done playing it safe & small for comfort in a life I wasn't fully happy in. I had to empower myself to see that I was worthy of more. I had to change my belief that my corporate career was the ONLY way I could be successful. I was no longer going to be a wanter, siting back talking about all the things I wanted in life. I was going to be a taker! I had to shift my thinking to first make the DECISION that I wanted more, then take the necessary ACTION & any self investments for the guidance & support I knew in my heart I needed to make it happen. I packaged my expertise & skills into a personal brand & within the first 3 months, I had signed my first 2 clients in 30 days, reached my first $5k month in 60 days, & generated over $10k in 90 days! Within a year, I became an International Best Selling Author, Keynote Speaker, & turned my expertise into a multiple 6-figure international coaching & training practice celebrating $15-$50k months doing work I love with clients I adore supporting & designing a lifestyle I’m obsessed with! And there, The First $10k Blueprint was born because I was tired of seeing women start & fail in their expert business everyday, getting sucked into the fake Instagrams & false promises of the online world of making $10k+ months in your sleep & $100k+ in cash in 5 seconds on the beach! YES, this is possible! Heck, I’ve made $20k cash in less than 48 hours while traveling & my clients have celebrated $10k hours, $20k weeks, & $30k months! Reality is, you will not make six figures if you haven’t mastered how to make your first $10k! And not just make it blindly, but create the foundation you need to be able to do it right the first time without wasting a ton of time, energy, & money, then do it again AND again! You know, to actually live off of! I've personally designed this program to help you clarify & niche down your expertise, establish your own personal brand, create the messaging to attract & engage your dream clients, understand how to leverage your expertise to create your framework & curriculum, & develop your signature money making plan & business model including your signature program and exactly how to package, price, position, promote & AND sell it, confidently & quickly! AND, BECAUSE I LOVE TO WORK WITH FAST ACTION TAKERS & WOMEN WHO ARE SERIOUS ABOUT GETTING RESULTS (BECAUSE I AM), IF YOU JOIN TODAY, YOU'LL BE RECIEVING OVER $15,000 OF LIMITED TIME ONLY BONUSES! It's over $20,000 of self study mindset & strategy video trainings with BONUS live direct access to me for coaching plus worksbooks to help you customize everything along the way even more, a community for extra support, & priceless bonuses to help you crush your first $10k goal! You’re good at what you do & know your gifts, expertise, knowledge & experience can provide REAL transformation, impact, & results for others that you have a burning desire to turn into marketable & profitable coaching, consulting, speaking, or training services, programs, products, & events! You already know what you’re good at & what you want to help your clients with & even see yourself being called upon as an expert & thought-leader in your industry, you just need more support to get started & powerfully communicate, package, price, & position it to sell for $500 to $3000 or more! You don't just want to create a product to make some money here & there, but want the step by step blueprint of a sustainable money making expert business for CONSISTENT results you can continue to expand your brand, clientele, & wallet with! You do not want to just look like you’re in business or have an expensive hobby! You’re an ambitious & resilient go getter who believes your success is a nonnegotiable & you value investing in yourself & into a quality program to make it happen! Create your signature program & powerfully position it better than you imagined attracting new leads & actually signing your first handful of 4 figure clients! Confidently communicate what you do even if you feel “too new” & get visible & stand out, even from people who’ve been in business longer! 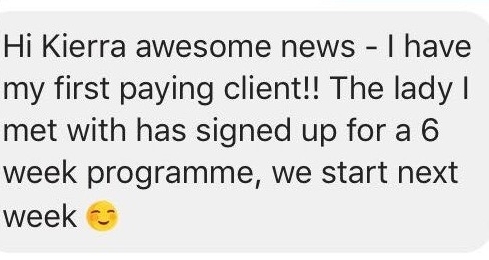 Get love notes back from clients about how much you’ve helped them & changed their lives, please all the referrals they are sending your way! Being able to look in the mirror & feel so overjoyed & proud of yourself for saying yes to yourself & the impact you are creating, bigger than you ever dreamed! 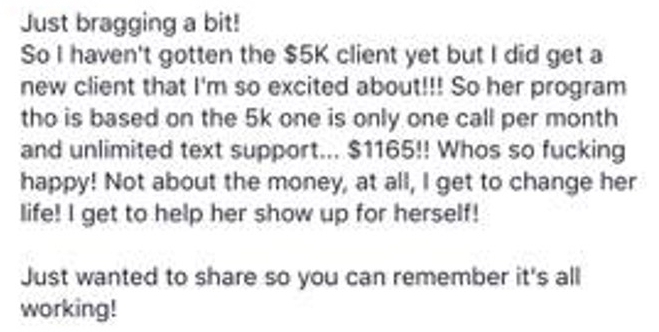 Get support from a multiple 6 figure coach when you have a question, don’t know if you’re on the right track, need a little mindset/confidence boost, or just want someone who gets it to celebrate your first or fifth $500, $1500, $2000, $3000, $5000 client! Help you get to know your dream clients on a deeper level so you could see exactly how you need to position your offers for clients who are ready to invest & don't want to take advantage of you or pay pennies for the value you provide; would it be worth it? Show you how to create a program that is $500, $1500, $3000+ AND actually sell it! Do you know at least ONE person right how you KNOW needs to be a client of yours? If we sold your first program, wouldn't that cover your investment into this program that's going to help you do that over and over again? How much would this be worth to you then? So, what are you waiting for? Aren't you ready to shine in your expertise & finally stop giving it away for pennies? Your success is going to require you to be a taker - someone who doesn’t need permission from anyone outside of themselves, & sits on the side & wait until some perfect moment that doesn’t exist because now is the only time that matters. You can’t continue getting ready to get ready & putting your ducks in a row because that still hasn’t gotten you where you really want to be in your business and it never will! This incubator is a vault of powerful, impactful, money making, what to focus on, exactly what you need to do, and how to do it to build the foundation for your first clients & first sales that will continue to pay for itself all the way to your third, fifth, tenth, twentieth client, & beyond! Most people starting out spend hours and hours learning & trying to put all the pieces together they get in freebies, webinars, free Facebook groups, & on YouTube, but still don't get it right, wasting time & leaving lots of money on the table! And although they are hurting their own wallets, the truth is, they are really leaving behind the people out there who NEED them to show up, who need them in their lives right now! That’s exactly why YOU can’t wait, keep getting ready to get ready, put more ducks in a row, go talk to anyone else about it - you have to trust that you following your heart IS the right thing to do & do it for those who need you & what you have to share with them right now! 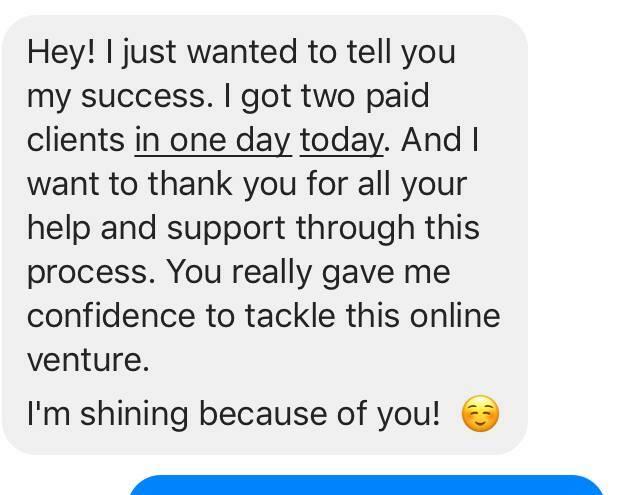 I literally have clients who have used these foundations to transfer people they were coaching for free into paid programs, sign their first 1-20th clients, create their first services & programs, sign their first $4000-7000 clients, and even go full time in their business in three months. So what are you waiting for. I know you're ready to take action and join us! 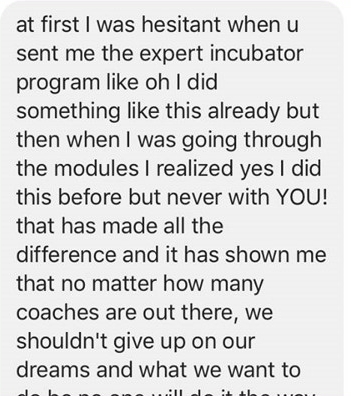 And because you're in love with everything you get in this program and more & you are ready for me to support you, I've made this EPIC experience of trainings personally designed & organized as THE blueprint for your expert business specifically made just for you! Based on all the trainings included, the value women are receiving, & the results they are getting literally within weeks of joining, you can see why this investment, regularly $2497 to help you achieve your first $10,000 in business is an insane no brainer opportunity because you get the entire experience when you join us today for only $997 & save $1500! NOW is your time and I want you to have the support you need so I'll see you inside The Expert Incubator! Your Lifetime Business Training Membership + Weekly Live Coaching Access to Me + Membership to Connect with The International Community of Expert Incubators + All the other epic bonuses for an investment of a one time payment of $497 USD ($2000 )!